I am Kaz Ueno and a Japanese teacher in Melbourne. I was born in Japan and moved to Sydney to complete my master’s education in 2004. Then I came to Melbourne to get a teacher’s qualification in 2006. I have been teaching Japanese at primary schools in Melbourne for nearly 10 years. I am really happy to see my students’ smiles when they learn Japanese with me. 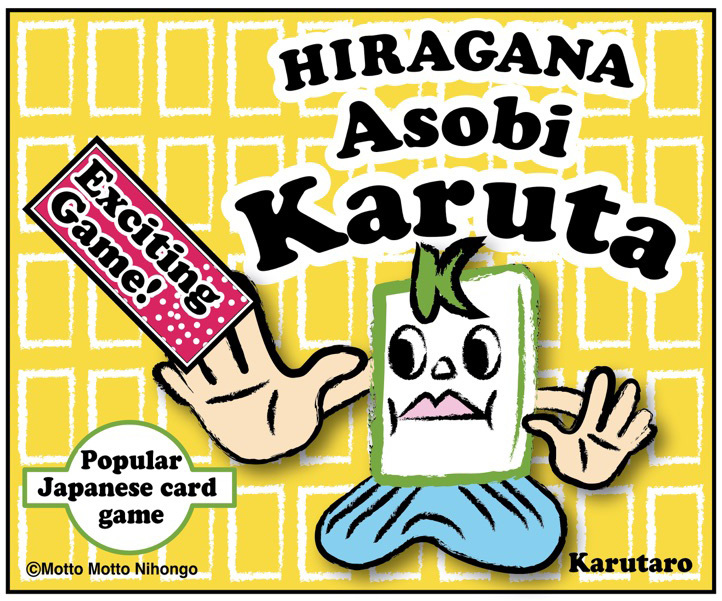 This is a simple version of popular Japanese exciting card game called ‘Kyogi Karuta’. It’s a card game, but it’s like a sport! I arrange this game, especially for non-Japanese people. The story of my game Hiragana Asobi Karuta started in 2014 when I was looking for some useful Japanese comic books for my students to understand some Japanese cultural aspects. I found a very interesting manga book called ‘Chihayafuru’ at an online book store. At first, I thought it was just a girl’s Manga because of the front cover, but when I got the first book and started reading it, I couldn’t stop as the story is so interesting. It is about the popular Japanese competitive card game called ‘Kyogi Karuta’. 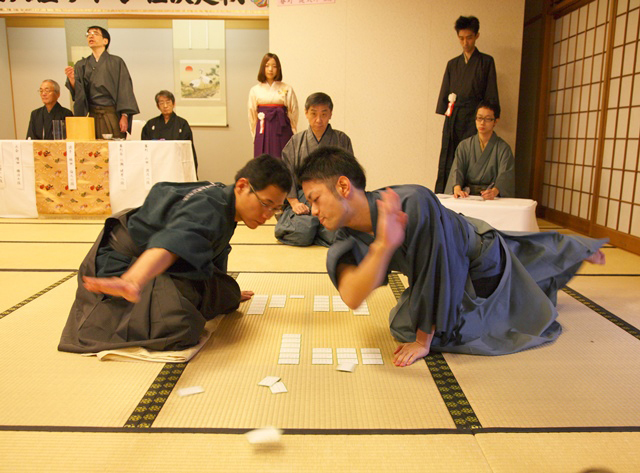 Kyogi Karuta is a Japanese traditional game. It is a one-on-one game and you use 100 poems in the game. 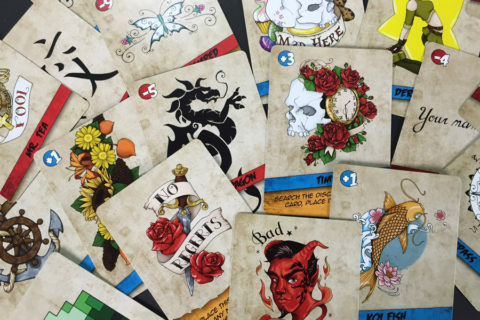 Each player randomly selects 25 cards and places them in the game area. The rest of the cards are called ‘Kara-huda’ that means dead cards and the players don’t use them in the game. A reciter randomly picks a card and reads it aloud including the dead cards. The players find a matching card, then swipe or touch it faster than their competitors. The player who clears his/her own territory is the winner. There are more than 1 million people playing Kyogi Karuta in Japan. I knew Kyogi Karuta was very exciting, but I had never had a go in my life because you have to memorise 100 old Japanese poems, but I really loved the rules of the game and I have felt a strong attraction to the speed of swiping cards. It is like a sport. So I decided instead of using the poems, I thought I could use Hiragana, a type of the Japanese writing scripts. I introduced my version of the game to my students and I was amazed to see them playing it with happiness. Many students memorised many words more than I was expecting and they all enjoyed touching the cards at high speed. They all gave me great comments and told me that they want to play more. That convinced me to make a better version. You might feel that my students are quite good at Japanese, but they only learn Japanese once a week for the last three years. So unfortunately, they cannot communicate with Japanese people yet. So my students can play it which means you can absolutely do it too. Hiragana is a 46 syllable phonetic system in Japanese. Asobi means ‘playing’. And Karuta means card or cards in English, but the word originally came from ‘carta’ in Portuguese. 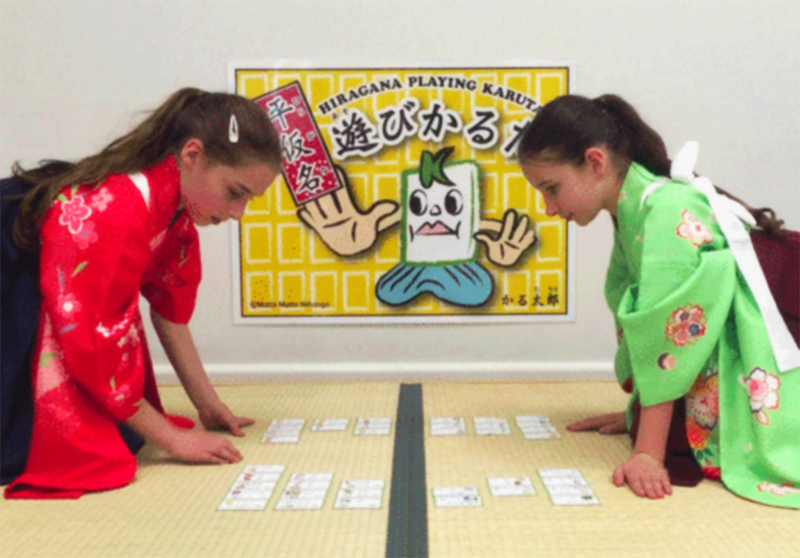 The word ‘Karuta’ is known collectively as Japanese snap card games. On each card, you see a targeted letter in a circle and basically two words. The words are written in Hiragana, Katakana and Kanji. They are all Japanese writing scripts. One of the specific features of this game is to develop your letter understanding. You might worry about the words in Japanese. Don’t worry about it because you see pictures and numbers on each card as well. If you play the game many times, you will find yourself understanding many words. That happened to my students and it did surprise me. So you can do it too. 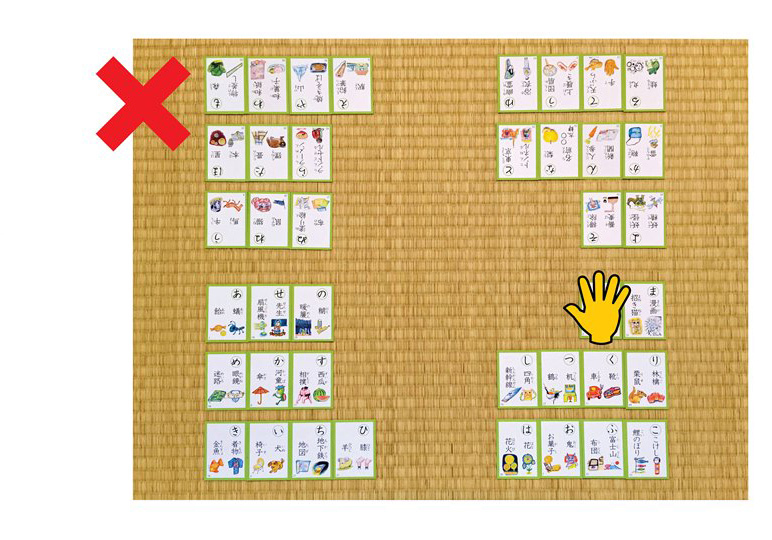 There is also a user friendly instruction coming with each box of Karuta so again you don’t need to worry about any words. Hope you can find your favourite cards. 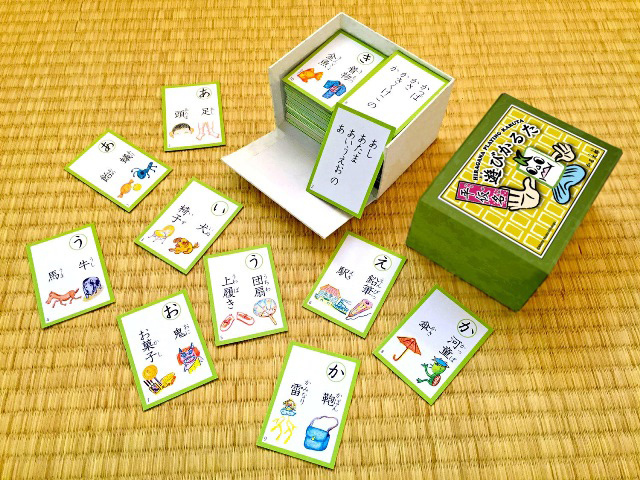 One of the interesting parts of Kyogi Karuta game is ‘Kimari-ji’. 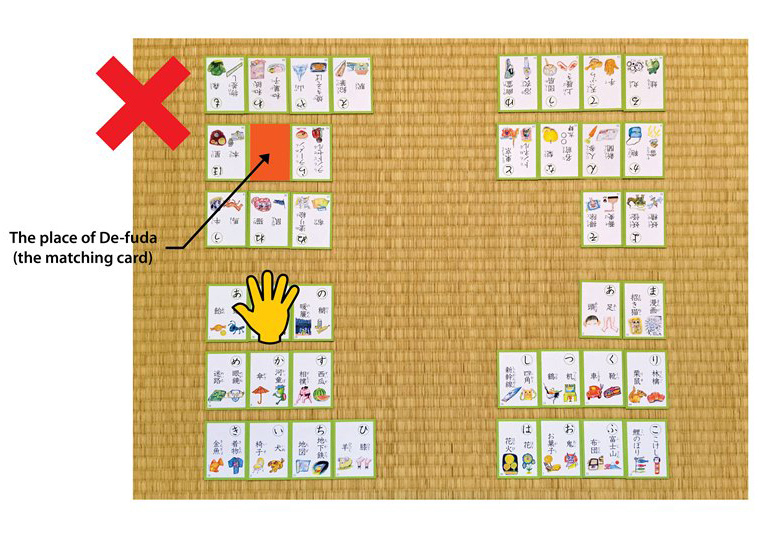 Kimari-ji is a syllable identification to swipe a card. That means, the number of syllables you need to hear in order to identify the matching card. If the first syllable of all the cards were different, you could easily have got the correct cards. It is not interesting. 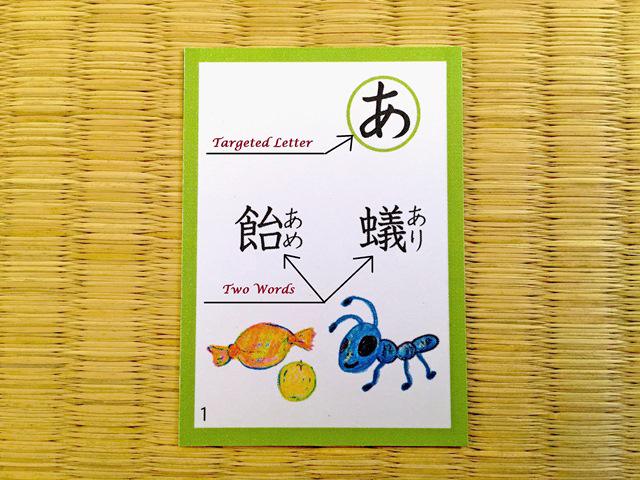 I spent a long time and successfully made some cards with 2 syllables, 3 syllables and even 5 syllables Kimari-ji. Then my Hiragana Asobi Karuta became a perfect game for you to play. The rules are quite simple. It is a one-on-one game. The winner is the player whose territory is cleared first. You and your competitor sit on a floor facing each other. There are 50 cards altogether. At first, you face all the cards down and mixe them well. Then each of you picks up 20 cards each. The remaining 10 cards are the dead cards so you place them back in the game box. Arrange your 20 playing cards in 3 rows on the floor in front of you. Memorise the placement of your cards and the opponent’s for 10 minutes. You are not allowed to touch the cards yet. If you don’t have any reciter to read aloud each card, you can use the original CD to play randomly. When the matching card is read and if it is in one of your territories, swipe or touch it faster than the opponent. You can, of course, get the opponent territory cards as well. You are only allowed to use one hand to swipe or touch a card. If you get a card in your territory, you simply take it. If you get a card from your opponent’s territory, you give the opponent one card from your territory. So you lose one card and the total number of your opponent territory remains the same. If the matching card is one of the dead cards, you should not touch any card in the territories. If you commence a foul, you receive one card from your opponent’s territory as a penalty. 1. When you touch the territory where the matching card does not lie. 2. When a dead card is read and you touch any card. The following case is not a foul. When you touch a different place in the same territory where the matching card lies. 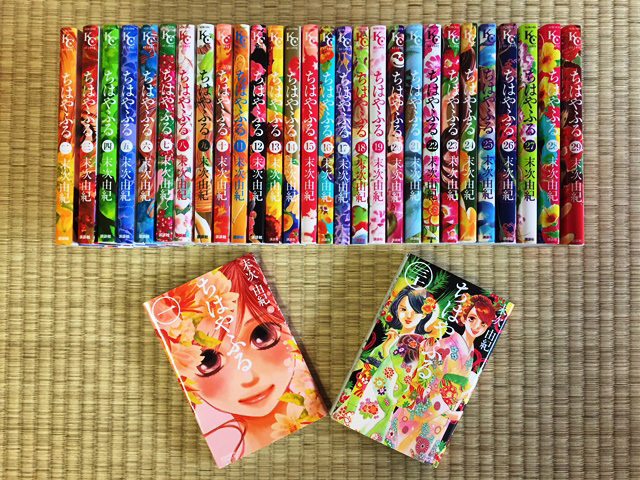 I have got the permission from the All Japan Karuta Association to use their official rules. All the Illustrations of the cards are drawn by Toshi Handa, a Melbourne based Japanese visual artist who has published several Japanese children’s books. 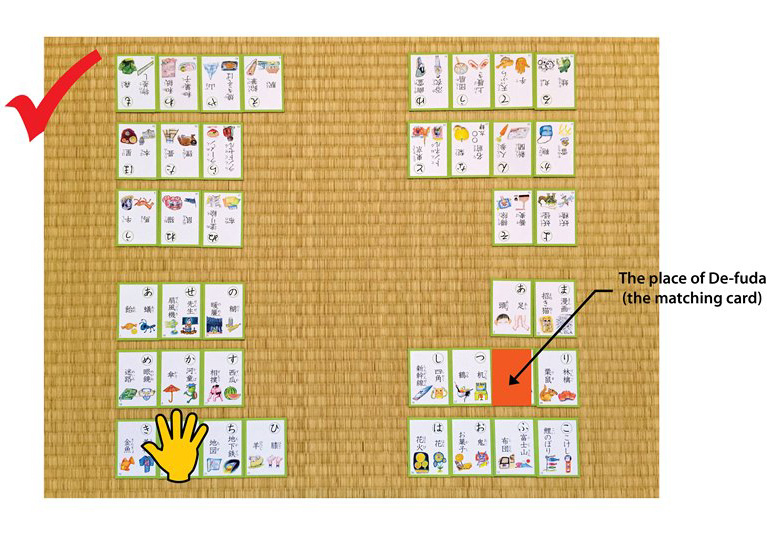 Hiragana Asobi Karuta is now live on Kickstarter. Fascinating game. I love the fact that it encourages physical activity. I appreciate your comments. 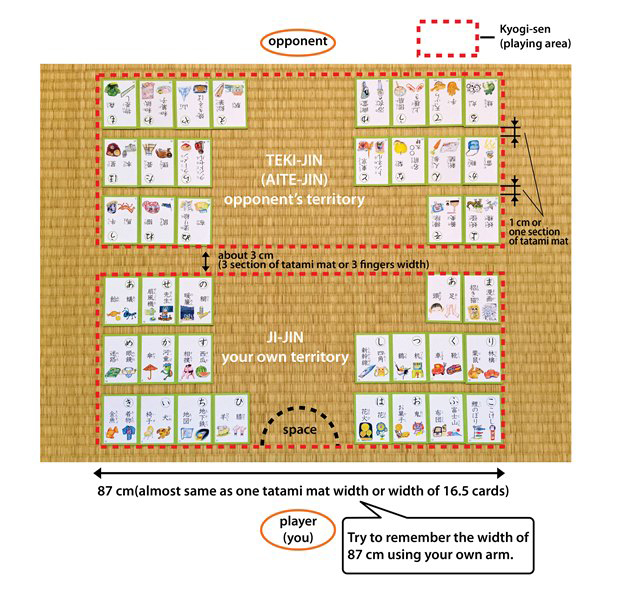 The real Kyogi Karuta game sometimes referred to as the battle on the tatami mat. So it’s quite fun. Thanks, Mia. The game is suitable for non- Japanese people. 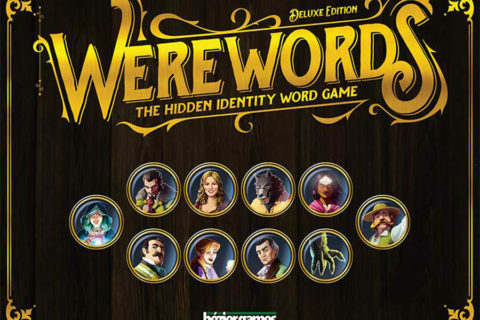 While you are playing the game, you’ll find that you pick up many words from the game. You don’t have to study the words, but you’ll understand them automatically. That is one of the aims of this game. Really like this game! 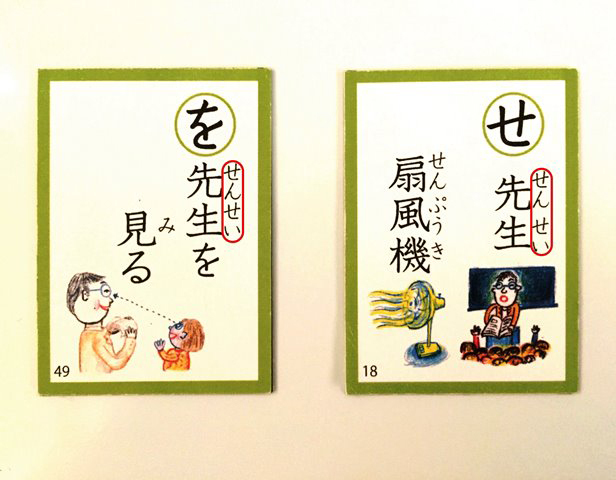 The modifications made to make it accessible for learners whose first language is not Japanese are spot on! Hope it becomes commercially available soon! It’s a winner! Thanks, Ngaire. I hope so, too. 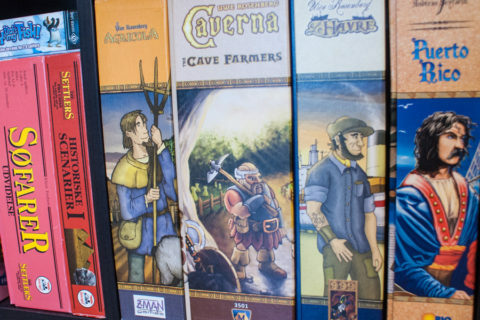 The original game is exciting, but it is quite hard for non-Japanese people. I really wanted my students to play the game with the official rules. So it was a huge challenge for me to modify the game as I should not have lost the interest parts of the original one. I’m currently running another campaign. Please visit and support my project. Thanks.